Why are my apples brown inside? Have you ever gone to pick your beautiful apple crop and found this inside? It’s internal browning, and it’s pretty gross. When it’s this advanced, it makes the apples completely unusable. 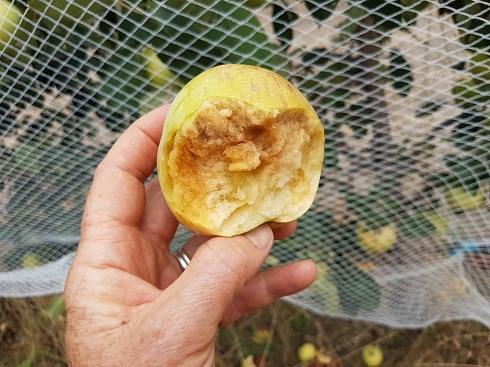 It’s not that uncommon to see it in apples that are picked too ripe or stored too long, and it’s a known potential problem when storing apples in long term cold storage, but it’s unusual (and unpleasant) to see it in apples that haven’t yet ripened, as we discovered in the Gravensteins this week. We’d normally be just starting to pick the Gravvies at this time of year. Most of the fruit isn’t quite ripe yet (as expected) — they’re just starting to colour up, and the seeds are just starting to go brown (an indicator of apple ripeness). 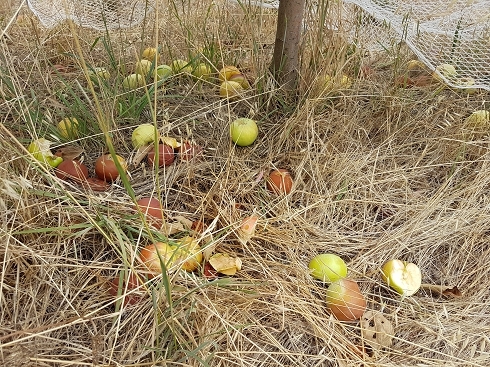 But when picking started this week we discovered quite a lot of apples had fallen on the ground, and many of them had browned off inside. The most likely culprit is the heat wave we’ve been experiencing in central Victoria. A lot of fruit can handle these temperatures OK (though they do need some extra care and attention), but it looks like Gravensteins are not one of them, possibly due to their European heritage and tendency to be a soft apple. 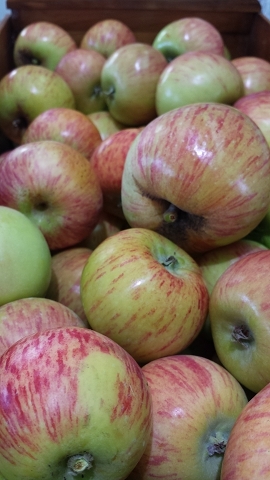 It’s the second year in a row this happened to this variety, which is making us question the wisdom of trying to grow apples bred hundreds of years ago in Europe in our very different climate here in Australia. As our summers seem to be increasing in heat intensity, this may become an ongoing problem and might eventually make the variety unviable in this growing area. However if there’s one thing we’ve learned over recent years it’s that the climate is variable, so it’s also quite likely that there will also be seasons when the Gravenstein shines, possibly in conditions that don’t suit other varieties — and that’s the key to the biodiversity plan that has led us to grow a big collection of varieties on the farm! For the moment at least, it will continue to hold it’s place in our crazy biodiverse mix! If you’d like to find out more about growing your own apples, we’ve bundled a lot of specific information into the short course called Appreciate Apples.